One wonders if some of Oconee�s leadership is more interested in perpetuating the development bubble and profits of today than the real water needs of the future for our community! There is plenty of rainfall data that illustrates that we have been in drought conditions since 1998 except for the years 2002-04. Charts below demonstrate that. Winter rains have helped fill Bear Creek Reservoir and other area reservoirs.However, they will not stay full without better planning and preparation than we had last summer. The Upper Oconee Water Basin Authority, Chaired by Oconee County’s Melvin Davis, did not take action to conserve water until late September when the reservoir was getting dangerously low. Having worked for 12 years on the developing and construction of the Bear Creek Reservoir in Jackson County gives me added insight and understanding of the challenges we face. That project took years and cost about $ 70 Million. Better management could have preserved that water supply much longer than what has happened. The reservoir has been operation a short time – less than six years! Oconee County should have been working with its Bear Creek Partners to expand the Reservoir and Treatment plant. That facility is in existence along with the pumping and piping set up to pump the water. When one seriously considers the H L C plan, the fallacy and wrongness of Oconee’s participation is outrageous. It involves 18 miles of pumping from the Apalachee at High Shoals to Hard Labor Creek, and THEN pumping treated water back to Oconee County. The total cost of that project ($ 352 Million) would have paid for the upgrade of all the Oconee County Interchanges on GA 316 in Oconee County and even some in Barrow! It is good to know that Bob Snipes and Gary Duck in Athens-Clarke County are still involved. They understand the problems and the challenges.The discussion about acquiring Tallassee Shoals Dam is encouraging. We should have been working with Athens-Clarke instead of striking out on the ill-advised Hard Labor Creek Project. Even if the current commissioners serve another term (many are praying the majority will not), they will not be around when the project is completed or fails to complete and cost overruns. One wonders if some of Oconee’s leadership is more interested in perpetuating the development bubble and profits of today than the real water needs of the future for our community! Lack of public discussion and “behind the scenes” decisions contributed to many mistakes by the Commissioners. Davis and Norris will be long gone before the real costs of their mistakes are truly known! Folks, we can argue about zoning and taxes but it will only get worse unless we address some leadership problems in Oconee County. It is not too late.However, we need some new folks at the controls and a new direction.The future of our community is at stake! 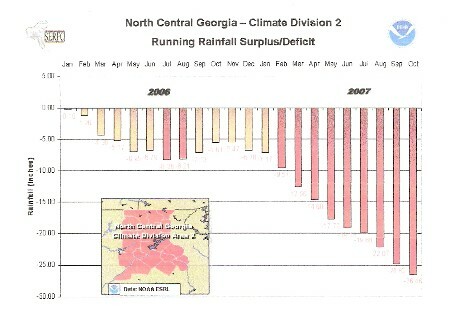 North Central GA running rainfall deficit 2006-2007 – Deficit was obvious long before action taken in late September. There is still a very good probability that drought conditions will intensify in Georgia. The outlook isn’t promising. Winter rains have been a welcomed sight for Georgians tired of dealing with the drought that started in March 2006. Unfortunately, drought conditions persist across much of the state, and will likely continue. The area north and west of the Chattahoochee River is in exceptional drought. Extreme drought conditions remain in the upper and middle Flint River basin, the upper and middle Oconee River basin and the upper and middle Savannah River basin. South-central and southeast Georgia are classified as being abnormally dry to moderate drought. Georgia’s fall line runs from Columbus east to Augusta. Streams north of this line are below or at record low flows for late January. 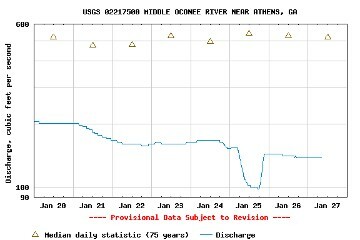 Rivers setting record low flows for late January include the Coosa River near Rome, Coosawattee River near Pine Chapel, the Middle Oconee River near Athens, the Alcovy River above Covington and the Flint River near Griffin. 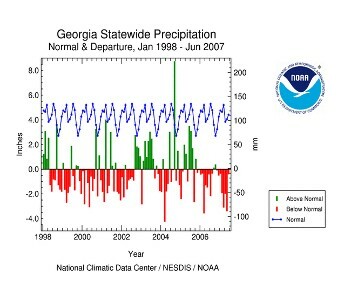 Rainfall deficits remains large across north Georgia. For the past 180 days, Athens has received 69 percent of its normal rainfall, Atlanta has received 73 percent and Columbus has received 89 percent. For the past year, Athens has received 63 percent of its normal rainfall, Atlanta has received 60 percent and Columbus 79 percent. The outlook isn’t promising. There is still a very good probability that drought conditions will intensify. …………………. For current Georgia drought information, go to the Web site www.georgiadrought.org. Weather information is available at University of Georgia automated weather station network Web site www.georgiaweather.net. Northeast Georgia officials are considering buying a Middle Oconee River dam to serve as a backup to Bear Creek Reservoir. Generating power at the small Tallassee Shoals dam in Jackson County no longer is profitable due to low river levels, so Lawrenceville-based Fall Line Hydro Co. is looking to sell it, project manager Robert Davis said. "We want to give the (Upper Oconee Basin) Water Authority a chance to look at it first, given the water shortages, the drought situation and so forth," he said. The basin authority is a partnership among Athens-Clarke, Barrow, Jackson and Oconee counties that built and manages Bear Creek Reservoir. Fall Line Hydro's pond, located on 35 acres of privately owned land, can hold about 114 million gallons of water, Davis said. Bear Creek Reservoir draws water from the Middle Oconee River through Fall Line's pond, and water held by the dam also could be released downstream and picked up by the Athens-Clarke Public Utilities Department, Davis said. The basin authority's engineering and finance committees met with Davis on Monday and talked about the offer in a closed session. No decision was made, Athens-Clarke Deputy Manager Bob Snipes said. "We still are evaluating it and discussing it," Snipes said………………. County attorney Kirby Atkinson said the bonds are not general obligation bonds and the county is only responsible if there is shortfall, an answer which still did not sit well with the commissioner, the lone dissenter of resolution. “I have too many concerns on the payback of the bonds, and I am especially concerned about Walton County’s citizens and the possible property owners having to foot the bill if something goes wrong,” Dixon said after the meeting. WALTON COUNTY — Trying to clean up any monies remaining from the 2001 Special Purpose Local Option Sales Tax, the Walton County Board of Commissioners voted last week to give the City of Social Circle $ 500,000 to repair the bridge on Hightower Road going over the CSX railroad. In other county news, after nine years and nine months in the making, the final bond resolution was passed for the Phase I costs of the Hard Labor Creek Reservoir project. The bond amount was finalized at $ 41.5 million in 30-year fixed rate tax-exempt bonds. The final “all in” borrowing rate was 4.66 percent and because pricing the bonds went well, the yield was lowered and saved the project $ 488,000 over the 30-year life of the bond. When voting on the resolution to finally put money into the project, Commissioner Kirklyn Dixon voted against the measure. The commissioner questioned the ability of the county to back the bonds because the county cannot assume new debt as incurred by the Walton County Sewerage Authority.